A burst or pinhole leak in a hydraulic system can cause serious problems – especially for anything or anyone located within a three-foot line-of-sight. Personal injury. Fluid burns and injection. Fires and explosions. Electrical shock. Mechanical failure. Now, Gates has engineered the first sleeving system specifically designed to protect operators, equipment and the environment from the hazards of catastrophic hydraulic hose failure – a level of protection previously unavailable. 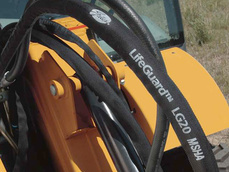 The LifeGuard™ line-of-sight sleeving system (patent pending) is an effective, economical alternative to costly metal shielding or re-routing of hose lines. And it does not affect system performance. The LifeGuard sleeve is slipped onto the hose and clamped at each end. If a hose burst or pinhole leak occurs, escaping pressures and fluids are contained by the exceptionally strong sleeve material. Fluids then exit the system via channels created by the specially designed channel clamps at each end. A noticeable pool of leaking fluid serves as positive verification that a failure has occurred and that corrective action should be taken immediately to replace the hose assembly.